A 17th century ale house where time has stood still. The building itself dates back to the 14th century when it was used as a grain store for the mill that was next door. A 17th century ale house where time has stood still. The building itself dates back to the 14th century when it was used as a grain store for the mill that was next door. The view from the windows was slightly different then! The Moor (aptly named) is reclaimed land and the river came right up to where Asha indian restaurant is now. It is now a Grade II listed building and on the CAMRA National Inventory of Historic Pub Interiors. The interior is smoke stained, the bar hasn’t been decorated since the 1950s. 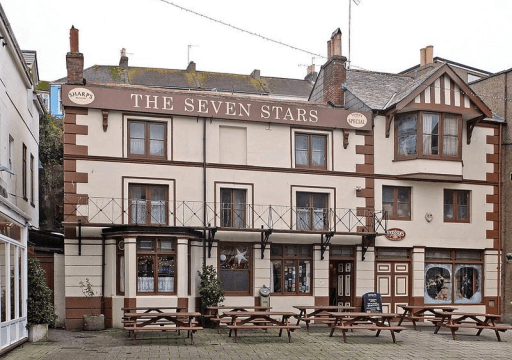 The Seven Stars was granted its licence in 1660, a year before Falmouth was given its Royal Charter and the licensee at the time was one Henry Penial and his spouse Mary-Jane! It has seen many changes around Falmouth and has also encountered many characters, from salty old sea dogs to royalty. Many of the characters worked on the water or for the water, on working boats or down in the shipyard. All of them had fascinating stories to tell. 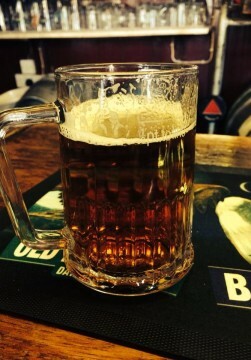 The pub has seen seven generations of the same family as landlords, dating from 1873, the most famous being Rev John Barrington Bennetts. He served as landlord for nearly 60 years while also serving his congregation at the Parish Church, before his passing back in 2011. There are quirky points to the pub, the coffin hatch being one of them, which you can find in the back saloon bar. An amazing collection of keyrings can be found in the bar which started back in 1953. We still find ourselves being handed keyrings from eager customers!